on a 350cc Royal Enfield in 1945. 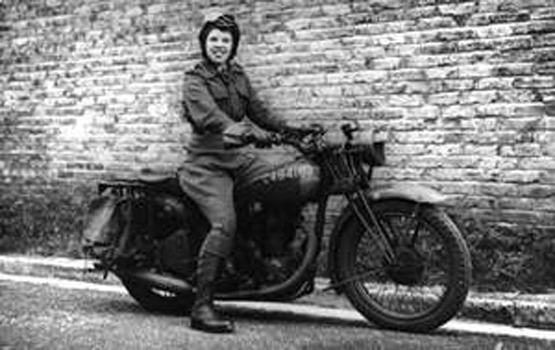 She had never even driven a car, but Joyce Preece eventually would become a motorcycle Dispatch Rider, pictured astride a 350cc Royal Enfield during World War II. Joyce was 20 when she joined Britain's Women's Auxiliary Army in 1941. She'd been thinking of joining, but the announcement that women over 21 would be conscripted made up her mind for her. "I then became a number. W120296. The training was very tough," she wrote in a 2005 story for "WW2 People's War," an online archive of wartime memories gathered by the BCC. The archive can be found here. Despite the tough training, Joyce wrote home "that I was having a great time. (What a fibber I was.)" 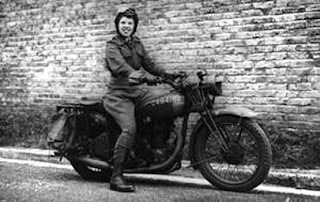 The Auxiliary Territorial Service taught her to drive but her natural pluck kept her at it, even after her car malfunctioned and overturned on her first solo drive. A kingpin had sheared. "I didn't even feel shaken; just mad as hell, as the battery acid had tipped all over my slacks and ruined them," she wrote. Duty behind the wheel was fine with her, even steering ambulances through the Blackout. There was never a problem with mechanics. "Of course, being women, we could wrap them around our little fingers when it came to asking for their help; mechanical or otherwise." She had volunteered for training as a driver and now went further still, volunteering to become a motorcycle Dispatch Rider. Her parents weren't thrilled, but she was. Her wartime story is complete with a flinty Regimental Sergeant Major, a kindly old colonel and a pillow wet with tears when a blond officer she met failed to return from France. Unfortunately it's missing a few paragraphs right in the middle of what must have been one very funny story. I've emailed the BBC asking that they be restored. See if you can imagine how that interaction between a "slip of a girl" on a motorcycle and a tough old soldier came about.